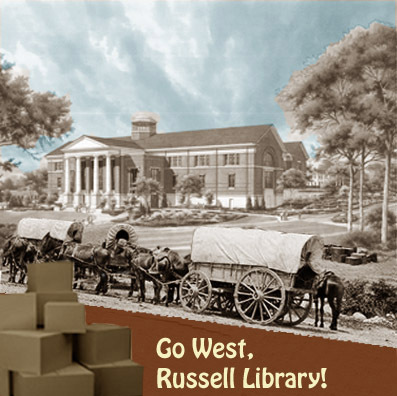 Richard B. Russell Library for Political Research and Studies: Go West, Russell Library! During the fall of 2011, the Russell Library, as one of the UGA Libraries’ three special collections libraries, will relocate from the Main Library to the new Special Collections Libraries building currently under construction at 300 S. Hull Street, Athens, Georgia. The move will result in delays in using materials held by the Russell Library as well as the Hargrett Rare Book and Manuscript Library, and the Walter J. Brown Media Archives and Peabody Awards Collection for the months of August through December 2011. Each of the three special collection libraries will close in sequence for a period of up to six weeks each during the fall semester. Russell Library will move first beginning sometime in August 2011. The timetable for closings will be announced in the weeks to come. Visit www.libs.uga.edu for general announcements. For specific information concerning the Russell’s move, see links below. To reduce the impact of the special collections move on researchers, the Libraries will partially open the Special Collections Libraries Building in the fall to provide prearranged access to materials once they have arrived at their new home. The Special Collections Libraries Building plans to open fully to the public with normal service and access to exhibit galleries in January 2012. To use collections in the Russell Library during fall 2011, researchers should make arrangements well in advance. Russell Library Blog (You're Already Here! ): http://rbrl.blogspot.com, Topic of Discussion "On the Move"